The Fortress of Civitella del Tronto stands at 600 meters above sea level, in a very strategic position, at the old northern boundary between the Kingdom of Naples to the South and the Kingdom of the Holy See to the North. It is one of the largest and most important work of military engineering in Europe, characterized by its elliptical shape with an area of 25.000 square meters and a length of more than 500 meters. The Aragonese castle, likely erected on a previous medieval structure, was completely transformed in 1564 by Philip II of Habsburg, King of Spain, who, because of the truly heroic resistance by the resident soldiers and the population of the town under the siege by the French troops led by the Duke of Guise, ordered the construction of the Fortress, a safer place as we see it today. In 1734 there was a change in the political dominion from the House of the Habsburg to the House of the Bourbon. Under the House of Bourbon the Fortress underwent important modifications of the military structure and those changes helped to oppose the siege of the French in 1806 and of the Piedmontese in 1860-1861. After 1861 the Fortress was abandoned, spoiled and destroyed mostly by the locals. 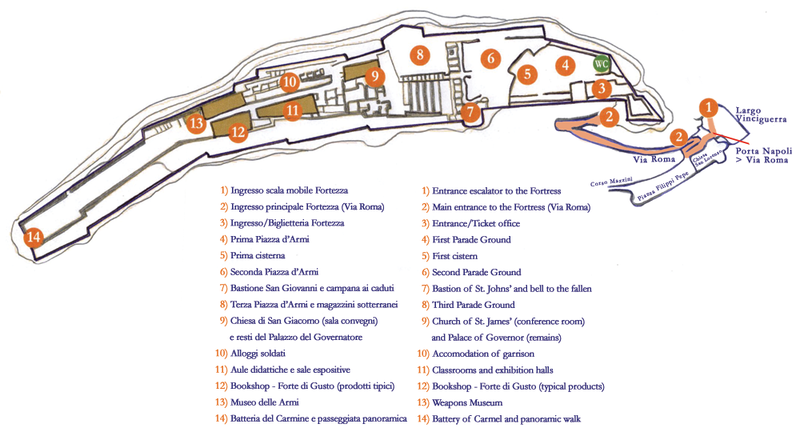 Today we can visit the Fortress thanks to a grant from the Historical Society of l’Aquila. The work of restoration took place in ten years from 1975 to 1985. The visit to the Fortress proceeds through three different covered communicating levels, the opened drill-grounds, water cisterns, the long sentry ramparts, the ruins of the Governor’s Palace, Saint James church and the barracks. Absolutely breathtaking is the panoramic view that you can enjoy from the highest point of the Fortress: from the old town rooftops with its stronghold corners, to the mountain range of the Gran Sasso and the Maiella to the South. The beautiful “twin mountains”, part of the Laga range, are just to the West. The orchard combed rolling hills to the North ending into the Adriatic Sea to the East! Within the Fortress it is possible to visit the Museum of Weapons that extends into four rooms. Each one keeps arms and old maps connected to the historical events of Civitella del Tronto. Among the arms we would like to point to some matchlock muskets of the XV century, flintlock handguns, a cannon from the Napoleonic War and some small cannons called “Falconetti” used by the Navy. The Fortress, with large outdoor venues, conference hall and exhibition halls of different sizes, it becomes an ideal place for any type of event.